Let’s roll out the red carpet. Established in 1823, Auchentoshan is one the last active distilleries in the Lowlands. It’s an endangered species in more ways than one, since it is also the only Scottish distillery that employs a true full-time third distillation, nowadays associated with mostly Irish Whiskey. The triple distillation gives this Glasgow malt a refined, delicate touch, which contributes to a very diverse spirit, perfect for your calm summer afternoon sip, but also the reason for you to paint the town red. The distillery is hoping to validate their reputation for making the smoothest Whisky possible with their latest number right here. Auchentoshan Blood Oak was released exclusively through the travel retail market and it put all Whisky aficionados on red alert. This, very expressively named Whisky, is of course triple distilled and non-chill-filtered. Matured in a combination of Bourbon and red wine casks, it is bottled at 46% ABV. The specific cask marriage contributes to an enticing Whisky, with a special spicy twist, provided by the French oak. The red wine casks are also the reason behind the deep ruby gold color, which is the inspiration behind the name. So, let’s just cut through the red tape, because we’re sure, you get it by know – the theme is red and this Whisky is rad. 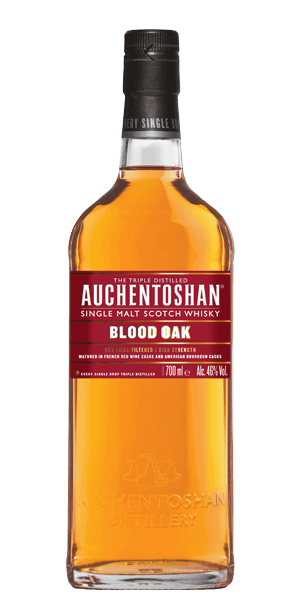 What does Auchentoshan Blood Oak taste like? The Flavor Spiral™ shows the most common flavors that you'll taste in Auchentoshan Blood Oak and gives you a chance to have a taste of it before actually tasting it. Red wine, barley sugar and citrus. Orange with spicy pepper notes along with a dash of sweet honey. The fruit notes it picked up from the wine cask are a unique and lovely addition to the spirit.